Designed to be used in a home or health club facility. A dynamic 23" x 35" wall chart designed to be used in a home or health club facility. 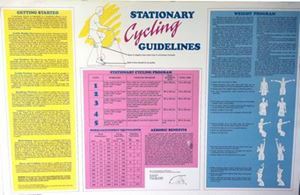 This chart is self-instructional and a comprehensive guide to understanding safe and effective use of stationary bicycles and ergometers. Through easy to read graphs and tables, the guide presents the necessary information needed to determine an effective cycling workout. Also available Stretching Pad and individual laminated pad sheet formats.